There were rumors earlier this month about the Bears exploring a trade of running back Jordan Howard. On Thursday, those rumblings were proven true as the Eagles are acquiring the back for a 2020 draft pick, ESPN’s Adam Schefter tweets. According to Schefter, the pick is a sixth-round selection that could become a fifth-round pick. In early March, it was reported “multiple teams” approached Chicago about a potential deal for the 24-year-old back and that discussions were ongoing. With less than a month to go until the NFL Draft, the Bears found a taker in the Eagles, who would appear to be out of the running to reunite with Jay Ajayi. Howard is entering the final year of his contract and will make about $2MM this season. Linked to running backs early in many mock drafts, the Eagles could still land a back in the middle rounds and let him develop under Howard. Like he did in Chicago, Howard is expected to fill first- and second-round duties with Philadelphia, while a collection of Corey Clement, Wendell Smallwood and Josh Adams vie for third-down responsibilities. Obviously, this could change if the team looks to add another back in the draft. 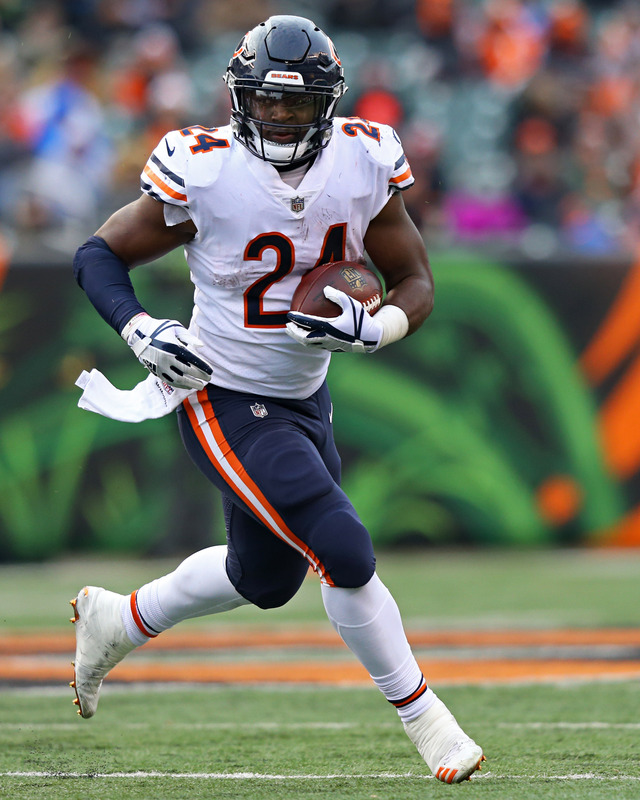 With the Bears, Howard burst on the scene in 2016, finishing second in the league in rushing yards with 1,313 yards and earning a Pro Bowl nod. He again topped the 1,000-yard mark in Year No. 2, tallying 1,122 yards and nine touchdowns. Though trade rumors swirled last season about this time, Howard returned to the team and amassed 935 yards and nine touchdowns on 250 carries, averaging just 3.7 yards a tote. With the move, the Bears appear to be confident in the one-two punch of Tarik Cohen and the newly signed Mike Davis. Cohen broke out in 2018, tallying 1,169 yards from scrimmage and eight total offensive touchdowns. Davis impressed in limited work with Seattle in 2018, averaging 4.6 yards per carry and tallying 34 receptions. It sounds like Jordan Howard‘s time in Chicago could be coming to an end. The Bears are having trade discussions surrounding the young running back, according to Adam Schefter of ESPN.com (Twitter link). Schefter writes that “multiple teams” approached the Bears at the combine about trading for Howard, and that discussions are “ongoing.” There was trade speculation about Howard around this time last year, but the Bears ultimately shot down those rumors and said they were going to make Howard the “main guy” in their backfield. After another disappointing season, they’ve apparently changed their tune. We heard last week that the Bears were shopping Howard, and it sounds like they’ve got some serious interest. Howard matched his career high with nine rushing touchdowns last season, but he wasn’t very efficient. He averaged just 3.7 yards per carry, down from 4.1 the year before. Neither number was anywhere near as good as his rookie season, when he averaged 5.2 yards per tote. 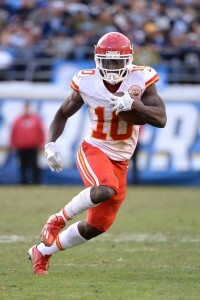 Howard was a fifth round pick in 2016, and immediately burst onto the scene as a rookie. He finished second in the NFL in rushing that year, and made the Pro Bowl. But he’s steadily declined since, and the Bears are looking to move in a different direction. Howard is heading into the final year of his rookie deal, and the team wants to get something back while they still can. Tarik Cohen, who has split time with Howard the past couple of seasons, isn’t really an every down back, so the Bears will certainly add some running back help at some point if they do trade Howard. Although Jordan Howard matched his career high with nine rushing touchdowns last season, his overall and per-carry yardage numbers continued to decline. 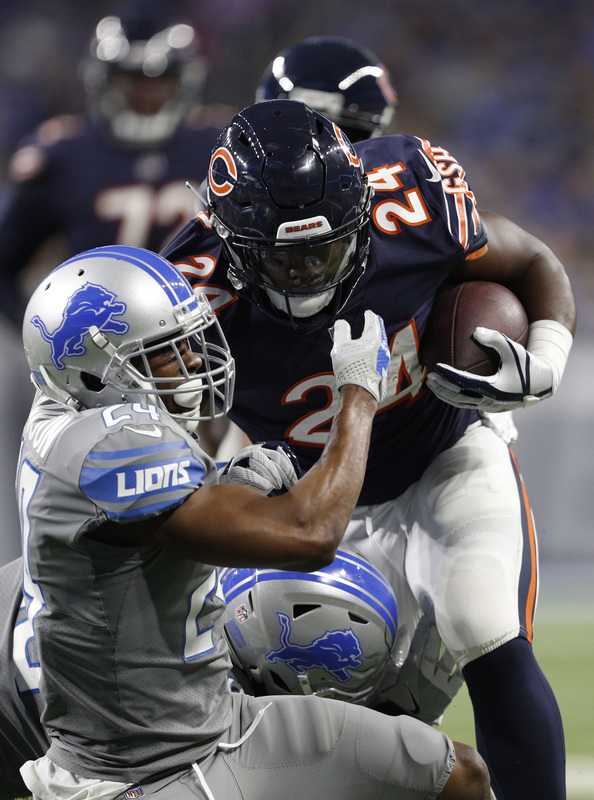 The Bears‘ starting running back failed to eclipse 1,000 yards for the first time and averaged 3.7 per tote, as Tarik Cohen gained a bigger foothold in Matt Nagy‘s offense. Howard did not make progress as a receiving back, either, in his third year. The Bears are indeed shopping Howard at the Combine, according to CBS Sports’ Jason La Canfora. One season remains on the former fifth-round pick’s rookie contract. Also being dangled for a trade, per JLC: Vikings cornerback Trae Waynes. One of three first-round picks in Minnesota’s corner corps, Waynes has been a two-year starter. But he is going into his fifth-year option season, which will cost the Vikings just more than $9MM. With Kirk Cousins‘ fully guaranteed contract on their books, along with several recently extended homegrown talents, the Vikings are up against the cap, holding barely $7MM. One place the Vikings may need funding for is their offensive line. Guard starter Nick Easton missed all of last season, hurting an already embattled unit, and is slated for unrestricted free agency. Rick Spielman said (via the Minneapolis Star Tribune’s Andrew Krammer) Easton should be medically cleared to resume his career soon. Easton underwent surgery to address a herniated disk in his neck. Easton also fractured his ankle in December 2017, so he may have to settle for a one-year deal somewhere. Brian Gutekunst confirmed what we heard recently: Jimmy Graham will have a second chance to make an impact with the Packers. A possible cap casualty, Graham is in line to come back, per Gutekunst (via ESPN.com’s Rob Demovsky). When asked Wednesday about Graham, Matt LaFleur was not yet sure the 32-year-old is the type of tight end that can create matchup problems at this point in his career, adding the caveat of not being in Green Bay last year to observe the physical issues with which Graham dealt. Gutekunst was non-committal about Nick Perry‘s future with the team. Indicating the veteran outside linebacker has been productive when on the field, the second-year Packers GM said a decision has not been made on this front. “Nick’s struggled through some injuries,” Gutekunst said. “It’s been unfortunate. When he’s been out there, he’s been a good player for us. We’ll make those decisions as they come.” It would not be financially advantageous for the Packers to cut Perry. The cap savings would barely exceed $3MM, while the dead-money figure would surpass $11MM. Three years remain on the contract Perry signed in 2017. Perry played in nine games last season and 12 in 2017. He registered just 1.5 sacks last season. Bears fans are excited about the innovations that new head coach Matt Nagy will bring to the offensive side of the football, and Adam Jahns of the Chicago Sun-Times believes that excitement is well-founded. Nagy has a great deal of young talent at his disposal, and while much of that talent is unproven, the club certainly has the chance to turn some heads this year. Nagy’s offense is expected to blend Andy Reid‘s West Coast offense with the run-pass options that offensive coordinator Mark Helfrich learned under Chip Kelly at Oregon, and it will certainly include creative formations and shifts. Nagy is also open to innovating and experimenting throughout the course of the season as he adjusts to life as an NFL head coach. In a separate piece, Campbell describes the importance of offensive lineman Kyle Long — who suddenly finds himself as the offense’s second-oldest player — to the Bears’ rebuild. There are a lot of intriguing new and relatively new offensive pieces at the skill positions, but those pieces cannot come together to reach their collective potential without a strong offensive line in place. Long, whose career started out with three consecutive Pro Bowl nods, has finished each of the last two seasons on injured reserve. However, Campbell reports that Long is as close to full health as he has been in two years, and that is critical not just for the Bears’ chances in 2018, but for both player and team from a contractual standpoint. After this season, Chicago could cut Long and save $5.5MM against the cap, so the next few months will go a long way towards determining Long’s future in the Windy City. Kevin White, who entered the league as a 2015 top-10 pick with a ton of promise, has seen the first three years of his professional career ravaged by injury. The Bears declined his fifth-year option earlier this offseason, so he will enter the last year of his rookie contract with a lot to prove. As Patrick Finley of the Chicago Sun-Times writes, White has a good chance of making the team’s roster out of training camp, but given the talent that Chicago has added over the past several seasons, he will need to perform very well in camp and in the preseason to earn significant playing time. Finley reports that White looks as good as ever from a physical standpoint, and the fact that he can line up anywhere on the field in Nagy’s offense will only help his cause. Earlier this year, Bears running back Jordan Howard was the subject of trade speculation. Based on what Howard has been hearing, there should be no more questions about his place on the team. “[New head coach Matt Nagy] already said I’m going to be the main guy,” Howard said (via Adam L. Jahns of the Sun Times). Nagy has also indicated that Howard is in for a big workload, though he cautioned that his offense doesn’t require a bell-cow back in every game. With Howard penciled in for a significant number of carries, it seems unlikely that he’ll be shipped out, which jibes with what the team told him in April. Howard, a fifth-round pick in the 2016 draft, has easily topped 1,000 rushing yards in each of his two NFL seasons. Given that Howard as a firm grip on the top RB spot over backups Tarik Cohen, Benny Cunningham, and Taquan Mizzell, he could have another highly productive year on the horizon. Howard is one of the better running backs in the league and also one of the very best values at the position. He is under contract for another two years with modest cap hits of $692K in 2018 and $782K in 2019. Despite some rumblings this offseason of a potential Jordan Howard deal, the running back has been assured that he is staying put. When asked about the speculation on Tuesday, Howard told reporters that Bears executives told his agent that they have “no plans” to trade him (Twitter link via Rich Campbell of the Chicago Tribune). Howard, a fifth-round pick in the 2016 draft, has been solid for Chicago over the last two seasons. He boasts a career average of 4.6 yards per carry and last year he topped 1,100 yards with nine touchdowns. He also hauled in 23 catches for 125 yards in 2017. If the Bears ever did entertain a trade for Howard, they probably set the asking price pretty high. Not only is Howard productive, but he’s also one of the league’s best values at running back. He is under contract for another two seasons with modest charges of $692K in 2018 and $782K in 2019. The Bears have yet to make any changes to their running back group this offseason. Reserve Benny Cunningham was the only free agent of note at the position and he was re-signed in early April after meeting with the Saints and Bucs. The Bears may look to add a supporting running back in the draft, but Howard remains their top option. There will be plenty of roster turnover for the Bears this offseason, but it sounds like Jordan Howard is staying put. The Bears have “zero desire” to trade the running back, sources tell Ian Rapoport of NFL.com (Twitter link). On Saturday afternoon, a report from NBC Sports Chicago ignited some Twitter buzz about a potential swap involving Howard and Jarvis Landry of the Dolphins. The Bears do have interest in Landry, but they apparently do not have interest in parting with Howard in order to bring him to Chicago. To that end, a league source tells Mike Florio of PFT that there is “no way” a Landry-for-Howard swap will go down. Howard has turned in two quality seasons for the Bears with a combined average of 4.6 yards per carry. Last year, Howard started in every game for the Bears and ran for 1,122 yards and nine touchdowns off of 276 carries. He also added 23 catches for 125 yards. A former fifth round pick, Howard remains under contract for two more seasons with cap charges of just $692K and $782K. Naturally, he is the kind of player that Chicago is intent on keeping. The Bears have not yet had a discussion about replacing starter Mike Glennon with fellow quarterback Mitch Trubisky, according to Ian Rapoport of NFL.com (video link). Through two games (both Chicago losses), Glennon has completed 67.1% of his passes for 514 yards, two touchdowns, and two interceptions. He currently ranks 21st in quarterback rating and 25th in adjusted net yards per attempt, while the Bears’ passing offense is just 26th in DVOA. Running back Jordan Howard is playing through a sprained AC joint, tweets Rapoport, who adds the injury could help explain why some scouts believe the Bears second-year back is running “tentatively.” Howard, who topped 1,300 yards on the ground in 2016 after entering the league as a fifth-round pick, has seen his snap percentage decrease this season as rookie Tarik Cohen takes on more passing game responsibility. Heading into today’s game Howard had managed just 2.7 yards per carry, but he’s already managed 46 yards and a touchdown against the Steelers in Week 3. While the Bears originally believed Nick Kwiatkoski was done for the year after suffering a pectoral injury last week, the linebacker’s health issue may not be season-ending, per Rapoport (Twitter link). While Kwiatkoski will miss several games, he’s likely to be available later this year. That’s an extremely positive development for Chicago, which had already placed starting linebacker Jerrell Freeman on injured reserve. Can the Bears rebound from their 0-2 start? Not according to PFR readers, who ranked Chicago as one of the least likeliest winless teams to perform better down the stretch. Check out the rest of the poll results and add your own thoughts here. Cardinals wide receiver Larry Fitzgerald told San Francisco cornerback Jimmie Ward he tore “something” in the second quarter of yesterday’s game (Twitter link via Josh Weinfuss of ESPN.com). Fitzgerald will have an MRI today to determine the severity of his injury. Through nine games this season, Fitzgerald has hauled in 68 catches – second in the NFL to only Antonio Brown – with 687 yards and five touchdowns. Losing Fitzgerald for an extended period would sting for Arizona and they’ll be hoping for the best when those scans come back. In a worst case scenario, Fitzgerald’s 2017 season is still guaranteed thanks to the terms of his recent extension. Bears rookie running back Jordan Howard suffered a possible Achilles tendon injury in Sunday’s loss to the Bucs, coach John Fox said (via Mark E. Ortega of NFL.com). 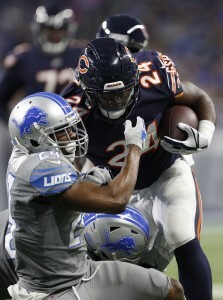 Howard, a rookie out of Indiana, was thrust into a starting role earlier this year when Jeremy Langford was lost to injury. Langford is back in action now, but the Bears were still relying on him as their top ballcarrier. For the year, he has averaged 5.3 yards per attempt. We should know more about Howard’s status soon. The Vikings should have traded for a tackle before the deadline, Patrick Reusse of the Star Tribune opines. The Vikings were relying on fragile veteran Jake Long to hold down a starting tackle spot but that plan blew up in their face last week when he suffered an Achilles injury. Before that went down, Reusse believes that cap guru Rob Brzezinski should have figured out a way to carve out cap room to allow Minnesota to add a much-needed lineman. Now, Minnesota is forced to start T.J. Clemmings on the left side. Cowboys defensive end Randy Gregory was hit with yet another suspension for drug use, but owner Jerry Jones says that the team is not giving up on him.